Big Finish: TORCHWOOD Broken Review | Warped Factor - Words in the Key of Geek. Tony’s broken after listening to the latest Torchwood audio. There are sudden, punch-in-the-face moments in long-running shows, and then there are shorelines, accretions of change over time that turn the texture of the show from one thing into another – just as there are in real life. In Torchwood, one of the greatest shoreline shifts was the change in Ianto Jones, from the buttoned-up, relatively unforthcoming reception-boy and coffee-maker into the full team member and lover of Captain Jack Harkness. It was a seismic shift in his emotional life, finally having what he thought he needed to cure his girlfriend Lisa of her part-Cyberisation, and failing so dreadfully, but in the wake of that moment, he seemed to drift further and further into action, into danger, and into Jack’s arms. 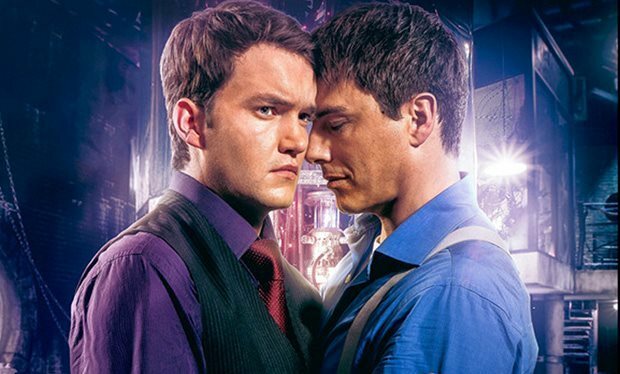 Many Torchwood fans see Jack and Ianto as a grand romance – and certainly by the end of their time together, there were good solid reasons to regard them that way. But while on screen we saw glimpses of the process of their edging towards each other, what’s never been especially clear in the on-screen world of Torchwood is how Ianto came to recover from Lisa’s death. One of the many joys of the Torchwood audios from Big Finish is that they have scope to scan the whole history of Torchwood – the history we’ve seen and the history we haven’t – and interweave their stories against that incomplete background. In Joseph Lidster’s Broken, we get a fairly definitive version of Ianto’s journey from post-Lisa heartbreak through some of the on-screen adventures of Series 1, including Countrycide and Greeks Bearing Gifts, to a confrontation with both Jack and Ianto’s own sense of increasing despair at having, as he says, ‘nothing else’ in his life besides work and sleep. Let’s say this so we’re clear – this is not Ianto as the comedy hero, as he was in Fall To Earth. This time out, in the first story to properly unite Jack and Ianto at Big Finish, we’re in the relatively relentless territory of Series 1 Torchwood, and we’re peaking behind the armour of Ianto’s perfect suit, and what we find is desolation. Ordinary, human desolation. Like Countrycide, this is Torchwood in one of its bleakest colours, and ultimately, it’s all down to human beings – what they do, and the effects they have on each other. That makes Broken a harder listen than many of the releases in the range, because even where it could be, Lidster resists the urge to pepper it with too much in the way of tension-breaking comedy. That’s a good decision – any way out, any capacity to laugh too hard at itself or at life or at the things that Torchwood does would puncture the fundamental structure of this story. So don’t, whatever you do, go in thinking ‘Jack and Ianto – let the good times roll.’ Good times have pretty much left the building this time around. That said, what you get here is an hour-long compulsion, a kind of hour-long Leonard Cohen song – and we mean that in the best sense. Yes, it’s depressing, but it’s depressing in that way that makes a kind of gritty poetry out of everyday life. There are angels of mercy, and devils of corruption, and humans in between trying to just get by and have some meaning, make some difference, find some smile that doesn’t feel like a lie or a suit of armour. Ianto, finding a pub he can call his local, with a good-hearted barmaid he can tell his troubles to, gradually unfolds the depths of his despair, his feelings of pointlessness, of being nothing and having nothing. Melanie Walters as Mandy the barmaid is very naturalistic as she becomes Ianto’s confidante, and potentially his life-saver when things just get too dark and hopeless for the local boy. In fact, Lidster’s story is almost a two-hander most of the way through, David-Lloyd and Walters narrating their way through Ianto’s Torchwood life, without ever giving too much away about the work of the Institute. Everything comes to a head though when Jack walks into the bar, in search of alien shenanigans responsible for missing people. The themes are dark, and they don’t get any lighter when Captain Cheekbones shows his face – in fact, they come to a head of confrontation, not just as a way of allowing Ianto to exorcise some ghosts and some self-loathing, but in a very literal reclamation both of power over his own life and the people in it, and a rather more notional reclamation of his ‘soul’ by what he decides to do with the power he regains. This is one of the most intense hours you’ll have spent in Torchwood’s company since early in Miracle Day, and very possibly the most relentlessly dark of the audio stories so far, despite many of them having a twist or two. This is Torchwood living up to its adult brief, not by titillating its audience, but by treating its characters as real, fragile, ‘broken’ human beings simply trying to get through an ordinary or extraordinary life. While our focus is on Ianto, and David-Lloyd delivers a solidity of performance that the on-screen show rarely demanded of his mostly clammed-up character, it’s telling that the investigation Jack is conducting is into people very like Ianto who have no Torchwood to save them, everyday people who find themselves ‘broken’ by the world. Walk any street. Whether you see them or not, the broken are everywhere. Jack even makes the point here that on some level, we’re all broken, all just trying to get through a life and a human experience that’s doing its level best to beat us down and make us quit. And Ianto goes through hell in this audio story to come to terms with Lisa and what was done to her, the impact of that on his life, and his relationship with both Jack and the Torchwood team as a whole. Coming through it, he determines that he can no longer be passive, no longer be that ‘nothing’ person in an impeccable suit – and at the end of the story, we see him take the first steps both to a fuller involvement in the work of the Torchwood team, and to a relationship with Jack, even if, like many relationships, it begins in catharsis, in a moment of what’s needed right there and then. Barrowman takes very much a back seat in the drama here, and really speaking, despite notionally being a ‘Jack and Ianto’ story, it’s really very much Ianto who carries the storytelling burden. Perhaps more than any of the other audio stories to date, Broken takes us into the deeper levels of a character with whom we think we’re familiar. 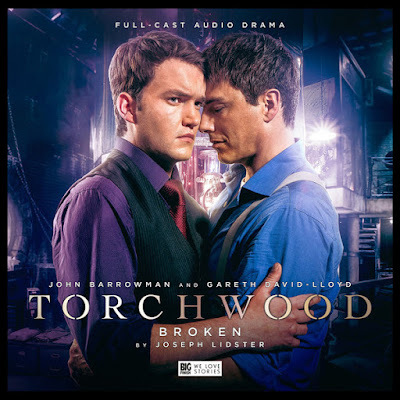 As such – and because Ianto’s story is so particularly harrowing – you may well need a lie down in a dark room and a nice cup of tea after finishing Broken, and it’s not one you’ll immediately want to go back and re-listen to, because it’s real enough to put you through the wringer. That said, you’ll never forget you’ve listened to it the once, because it fills in so much contextual and character detail about a much-loved member of the Torchwood team, and you will go back and listen to it again eventually, once you’ve gotten over it, and probably called all the friends you have for a solid catch-up and a listen to the woes in their lives. Joseph Lidster has done perhaps the most difficult job in Torchwood audio – he’s explained the shift in Ianto’s character and life, and he’s done it without cheap shots, without looking away, and while making a valid sociological point into the bargain. Yes, sure, there’s an alien involved, but really, this is the most human of Torchwood audios to date. Get it, listen to it, have the lie down and the cup of tea and call all your friends. Everybody’s broken somehow. It’s only through sticking together that any kind of fix can come.